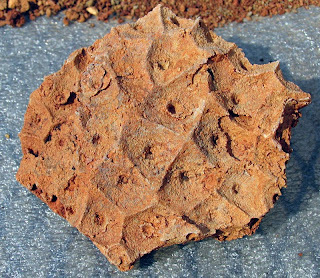 This coral is found in the Louisville Limestone and existed during the Middle Silurian Period (428-422 million years ago). It was called Arachnophyllum sp. and was found in Louisville, Kentucky. E.C. 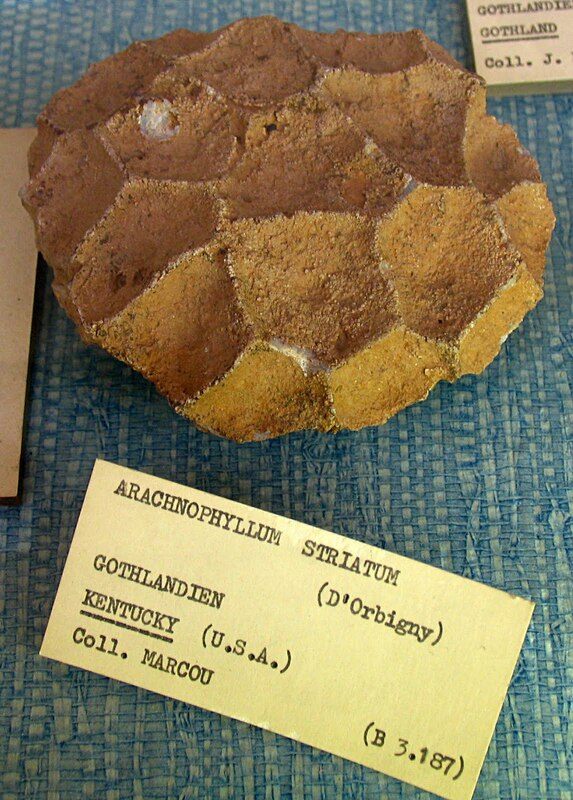 Stumm's book Silurian and Devonian Corals of the Falls of the Ohio list a number of species of Arachnophyllum. The first is Arachnophyllum pentagonum (originally called Strombodes pentagonum, 1826) by George August Goldfuss its holotype is stored at the Paleontologisches Institut, Bonn University in Germany. The next species is Arachnophyllum striatum (Favastraea striata, 1850) named by Alcide d'Orbigny. Its holotype is probably at the École des Mines in Paris, France. The picture below is of a specimen on display at the Natural History Museum in Paris, France. The Arachnophyllum sinemurum was named by William J. Davis in 1887 (Strombodes sinemurus). The lectotype (specimen 8072 - now MCZ 105622) is stored at the Museum of Comparative Zoology at Harvard University, Cambridge, Massachusetts. Edward Oscar Ulrich named Arachnophyllum separatum (Strombodes separatus, 1886). Its holotype is in the Greene collection at the American Museum of Natural History in New York City, New York. William J. Davis described the Arachnophyllum quadrangulare (Strombodes quadrangularis, 1887) in the monograph Kentucky Fossil Corals. The holotype (specimen 8059 - now MCZ 105625) is stored at the Museum of Comparative Zoology at Harvard University, Cambridge, Massachusetts. The geologist and artist with ties to New Harmony, Indiana, David Dale Owen is credited with describing the Arachnophyllum mammillare (Astrea mammillaris, 1844). E.C. Stumm did not list a location of the holotype.